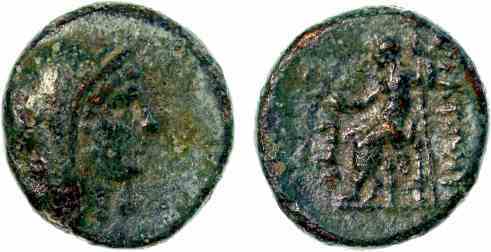 Bronze AE17, 17mm, 3.99gm, issued 244-221 BC. Obv: Veiled head of Berenice right. Rev: EKATΩNYM ΠTO, Triptolemus seated left holding corn ears and sceptre. Berenice II was the wife of Ptolemy III. At this time Lebedos in Ionia was under Ptolemaic control and known as Ptolemais.